"At last I'd filled my naughty tum . . . Then came a grumbling from my BUM! It felt as though the ground was shaking! Oh what noise my gut was making!" Riotous story-time fun concerning a young boy who consumed everything in his path and the hilarious consequences of his actions! 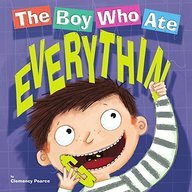 The Boy Who Ate Everything is a hilarious picture storybook from Top That Publishing that will have boys and girls aged 3+ laughing out loud.